This trip visits much of China, both modern cities and rural areas. The majority of travel is by public transport where we not only mix with the local people but ensure a much lower carbon footprint than if we used our own dedicated vehicle. We also use locally owned hotels throughout the trip, ensuring benefit to the communities we are visiting. On this trip you will stay in a mixture of hotels and guesthouses with a much more local feel than the many international chain hotels that can be found throughout China. 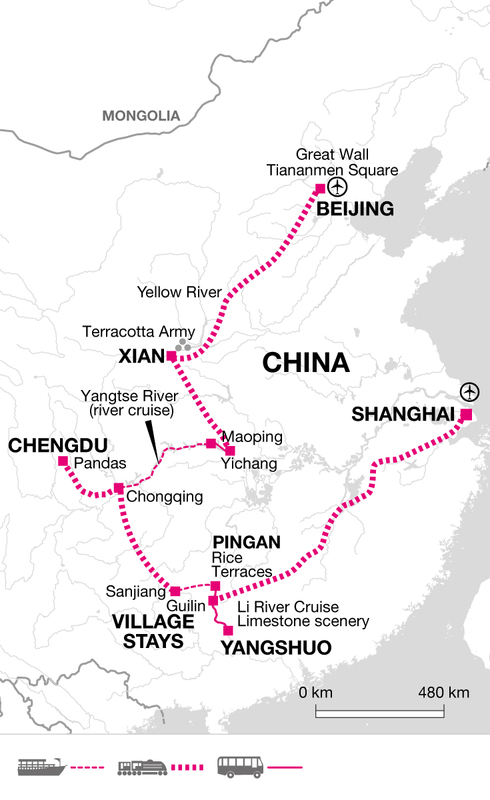 However a real highlight is the 4 nights spent on a river boat on the Yangtse. Not only is this a spectacular way to explore the river it is also a much more sustainable means of transportation, rather than using road transportation. In addition to the river boat we also spend 3 nights on an overnight train, which is a great way to meet local people and learn about local life. The accommodations are quite basic on the train but allow us to get more quickly to our destinations whilst really getting to the heart of Chinese culture and customs. We use local tour leaders and guides which means that we get in-depth information on the country we are visiting and generate wealth for the local people. China has wealth of history and culture to explore as well as how life is in modern day China; from learning about the education system, to making sure we don’t fall foul of any taboos! Meeting the people is often a great highlight of a tour and our leaders are real facilitators; enabling us to meet and mix with local people wherever possible – all the more fun when we are traveling off the beaten track. Our local leaders take us to small, locally owned and run restuarants wherever possible throughout the trip, ensuring that small businesses benefit from our visit, and that we enjoy a very authentic experience. city and lime kast mountains. Not really. There is too much plastic waste in China. You cover a vast area in a decent period of time. Hi Dominic thank you for reviewing your vacation and great to hear that you enjoyed the trip and have some good memories to bring home with you. With regards to the environment it is a problem in China and as you have pointed out there is too much plastic waste. From our perspective we try to assist the environment through measures such as using public transport - particularly trains and boats which cuts down on the carbon emissions that would be generated from private vehicles but we are fully aware of the issue with plastics and are working with our local agents to try to reduce this where we can. It is a long haul however! As a company we are very involved with the whole issue of plastic waste and have introduced such initiatives as Water to Go to help reduce the amount of plastic bottles used on trips. Many thanks again for your valuable comments.